The world's largest aircraft, designed to one day fling rockets into space, has tested out its taxiing capabilities at the Mojave Air and Space Port in New Mexico. The 500,000lb (227 metric ton) "Stratolaunch" is the brainchild of Microsoft co-founder Paul Allen and advanced materials aviation wizard Burt Rutan. The pair plan to carry rockets up to high altitude before they fall free, fire up, and deliver cargo into low-Earth orbit. Using Bernoulli's Principle to do the heavy lifting for the first few kilometres saves rockets the fuel-intensive and very stressful early moments of flight. Allen has sunk $300m into the much-delayed project, but on Sunday it rolled out of the hangar. With six engines usually employed by the Boeing 747 providing the power, the outing tested taxiing speed and stability. The aircraft hit 46 miles per hour (74 km/h) on the tarmac and its brakes and steering performed as required. Flights aren't planned for months yet, with a 2019 takeoff also possible. Allen and the team have worked on the project for around six years. The aircraft was due to fly in 2015 but development of key elements was delayed. SpaceX was due to build the rockets Stratolaunch would launch, but Elon's Musketeers pulled out in 2012 to focus on its Falcon 9 launch system. Allen's team instead turned to Orbital ATK, which will sell off-the-shelf Pegasus XL air-launch vehicles capable of delivering 1,000lb satellites into low-Earth orbit. 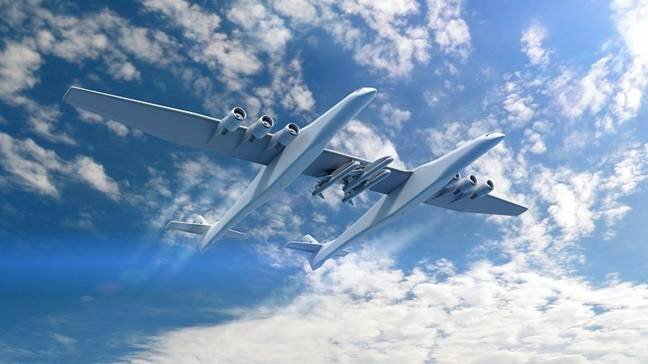 Stratolaunch may be able to carry multiple rockets on a single trip and has also considered developing its own larger rockets capable of hauling heavier payloads.